That is quite possibly the cleanest DW internals I’ve ever seen–it does look close to unfired. Yeah it is tough to get everything to stay put. Hopefully the pics will work this time, but I think the ledge is fairly square. I’ll try drying up some of the lube when I get a chance to see if it helps. Can’t help but notice that if you compare the two springs that the new one is more wide open. They are wolff springs BTW. 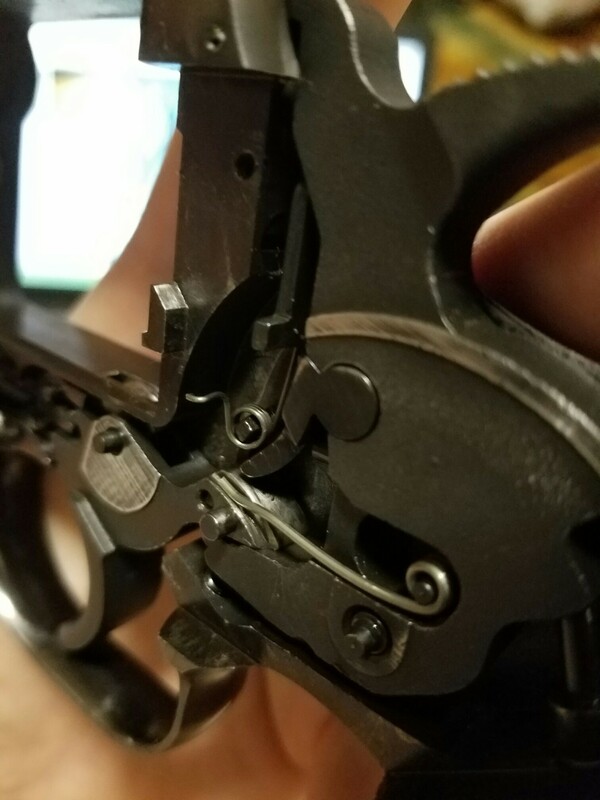 One thing to check for your sticking trigger is the overtravel screw–if it is in too far the trigger can “overcenter” and not return properly. back it out a few turns and see if it still happens. I think you are holding your upper lip wrong when trying to replace the sideplate. Nah, just takes a little practice. You will notice a big difference in the Wolff return spring. Check and see if the frame posts are fully pressed in. Sometimes strange things can happen if they are not fully seated. Thanks for the advice. I’ll check the frame posts and keep playing with the side plate. It is very hard to find the right spot but when you do it snaps right in. I previously replaced the hammer return spring with I think an 8 LB wolff spring but also have the 7.5 LB spring. Has anyone had experience with light primer strikes at 7.5 LB? This is awesome thread !! great info. I haven’t even received my 15-2 and I am already thinking of doing the same. Mainly just so I understand how everything works internally. I bought a 1979 2 1/2″ Model 15-2 just like Shoot’s last Saturday, joined the forum on Sunday, introduced myself, described the problems I was having with the old 15-2 and immediately Ole Dog pointed me here. This evening I finished my Average Joe Tune-Up, and enjoyed it. What a truly simple mechanism! It had a great trigger before I messed with it… now it’s even better. I still have one issue in this old gun. Before I worked on it, if you pinched the cylinder with slight pressure while dry firing, it would come to one chamber where the cylinder stopped and the action proceeded. It does that far less often now, but it does occasionally happen. It’s just as if there were no little spring on the back of the hand. It could be that the little spring on the back of the hand is weak. It could also be that there is wear on the hand or the wheel that the hand engages on the rear of the cylinder. 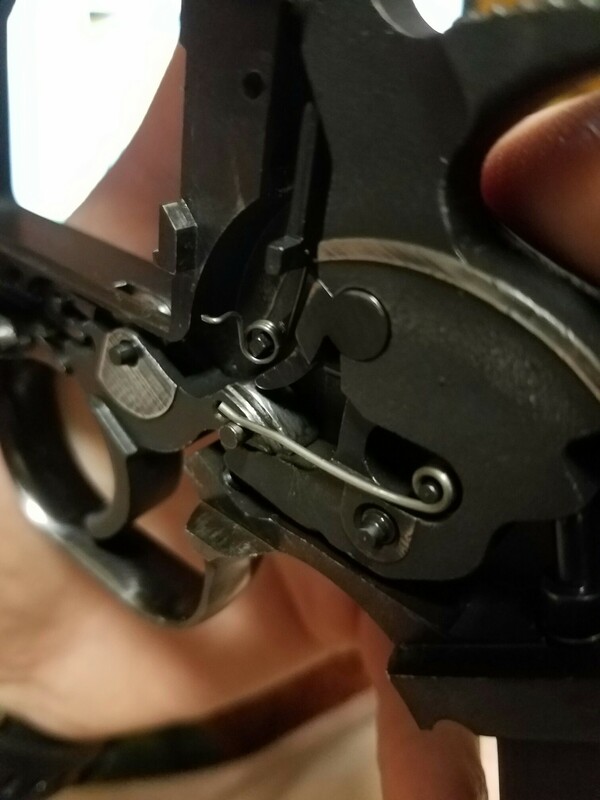 When I fired this pistol on Saturday, it shaved a little smile of lead on one cylinder, which dropped into the mechanism and jammed it. I’ll shoot it again soon and see if that was caused by the gunk that filled the inside before I cleaned it up. Measured the cylinder gap at 0.006″. What’s it supposed to be? .006″ would be the maximum on the proudest chamber. I tend to run .002-.003″. Shot the Tuned Model 15 today… no failures of any kind until after 70 or so shots… cylinder would stop turning, action kept cycling. I think the spring pulling the hand forward is weak. Spring Pak is on the way, but I’ve forgotten if it includes that spring. I think Ron, the first Ron, is correct. When you use a gap of .002 or 3 you should wipe the face of the cylinder with a rag every several cylinders full. Take the tool to the range with you to adjust the gap. That is one reason the factory specs are .006. The cylinder expands after about 50 rounds or less. The large frame guns don’t do that. Replace the hand spring first too. It is like auto mechanics. Try the little things first to correct a problem. It very well could be just the cylinder rubbing on the barrel on the proudest chamber when hot. I mentioned Karl Lewis, considered the world 2cd best gun designer after God, John Moses Browning. He designed the Colt Trooper Mark iii. He pioneered drop in parts made by MIM that did not need hand fitting. He was the first to use a coiled hammer spring instead of a leaf spring. The lockwork is extremely simple and the hammer fall was the shortest at the time. Manurhin, Korth and Smith have all copied many of his ideas. He offered the interchangable barrel to Colt but they declined. Shortly after he partnered with Dan Wesson. One reason they may have passed is the barrel cylinder gap issue. 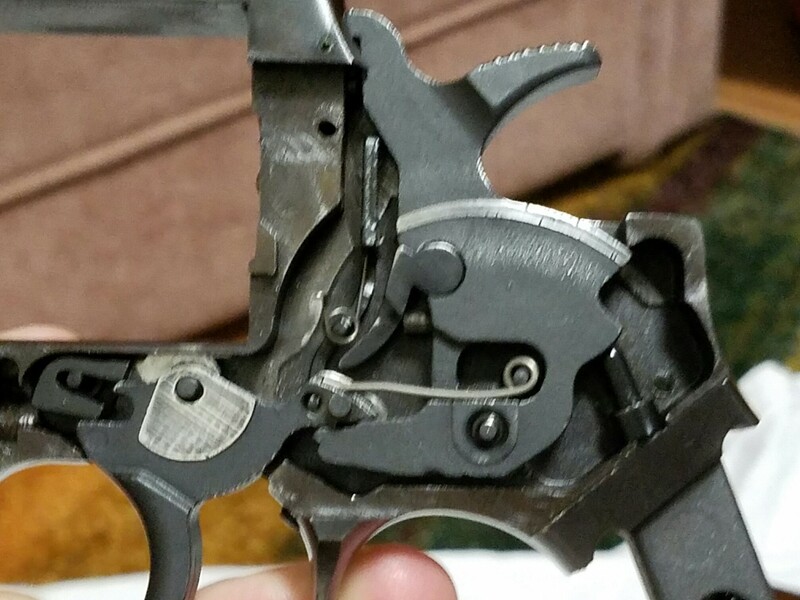 Dan Wessons are thinking man’s Revolvers. You cannot just pick it up and shoot. There are very many almost pristine Dan Wessons around today because setting the gap was too complicated for most gun owners. When they encountered what you did they put them in the safe or drawer for 30 years. I commend you for tinkering and finding the problem. DWF is a great resource that did not exist until Jody started it. Karl Lewis…He also won nine gold medals, including four at the 1984 Olympics in Los Angeles. I’ve run into this. I thought something broke then I realized it was just the cylinder contacting the back of the barrel. Took probably 50 rounds of 44 magnum for it to happen. Adjusted the cylinder gap, good to go! Hi guys.. been a while since I’ve posted here.. I’ve got a little .22 S&W that locks the cylinder when it’s had a few too many.. I clean the front of the cylinder with a couple of wipes with a rag… I would think just adjusting the gap would not be the best idea.. I suppose you could but that gap is set by DW for a reason. Love the comments..